I get numerous emails coming from all parts of the world and many revolve around the subjects listed below. Whilst they are genuine questions from genuine Koi enthusiasts and deserve genuine answers I cannot give any worthwhile replies to these and nor can any human being I know of and yet the questions continue. Perhaps it’s time for ‘TRUTH’ again? I have ‘generalised’ here but the questions below go to make up the majority of requests I receive. There are many more specifics asked but most revolve around or are linked to the above. Of course, I could give detailed replies with long Japanese words sprinkled mystically here and there; alternatively I could point out one Koi and say ‘That’s the one to buy!’ – I could give a thousand other nonsensical replies or I could simply duck out by saying ‘Sorry, my latest model crystal ball is away for servicing right now’. Let’s look around what some others have to offer on some these very same subjects. A. For many years now I have seen numerous articles in Japanese Koi magazines where the famous breeders have been interviewed in order to discuss the Koi they have produced in recent and past years. Pictures often accompany these interviews with texts relating to a few Koi and there will be shots taken of a particular Koi. One will show it at 20cms; the next at 32cms; the next at 50cms and then the current/latest one at 70cms. There are obvious skeletal changes to the Koi through the natural ages of growth and more often than not pattern change in Go-Sanke are usually the easiest to detect by photographs. The breeders will then describe all the finer changes that have taken place as he has observed them in all stages of growth. 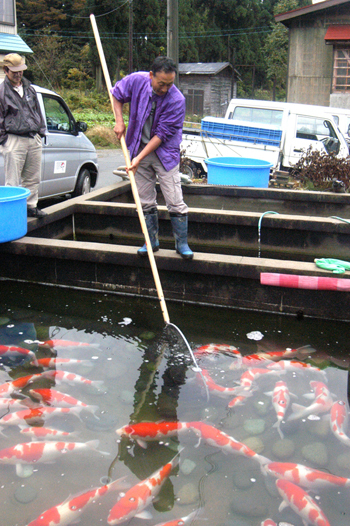 Some of the finest Koi producers in the world have been interviewed regarding these matters. They have shown examples of Koi they have bred and kept for some years; more often than not they have developed superbly and probably attained the mature specimen quality that is very close to the breeder’s early expectations. However, the Koi in question generally is a famous Koi selected from some of the best he has produced, it has been raised by the breeder with his own keeping methods namely his water volumes, his filtration methods, his water temperatures, his feeding regimes and his expertise amongst a host of other variables. Had that same Koi been purchased by someone else at the 20cms size and taken to a pond some 5,000 miles distant, the chances of it becoming as good as the same one shown at 70cms in the breeder’s ponds are not great. However, there is also a possibility it could have turned out to be even better! One thing is certain; the breeder cannot possibly advise how one of his Koi will develop in the care and keeping regimes of another individual whilst being kept in a pond he has no knowledge of at all. On rarer occasions a truthful breeder will display a series of pictures showing how a particular tategoi of his has turned out to become much lower than his earlier expectations – I assure you, this situation is far more common in real life than the success stories. To add to this confusion, just check out the words of the breeders who openly state ‘Oh, my Kohaku are far better in this mud pond than my other mud ponds but this mud pond is poor for developing Sanke.’ I have heard many such statements over the years – should we really build different ponds for each variety? B. In other Koi magazines produced in other countries we can find articles by various Koi dealers with a selection of several Koi (usually of the same variety and size and produced by the same breeder) before them in a bowl. The dealer in question will then discuss each one in detail and eventually come up with the one that he would genuinely select from the ones before him. After this, he will place the others in some order and then list ‘first’ to ‘last’. These articles are commonly given titles such as ‘You can become an Instant Expert in the selection of Shiro Utsuri’ or ‘Learn the finer points on How to select your Tategoi’. In the vast majority of cases, these articles are produced at the specific request of the magazine’s staff probably after random requests from their readers. This puts the unfortunate dealer in question in an almost impossible situation because he will be well aware that what he is doing bears no relationship to any real facts nor can it possibly ‘teach’ anything at all to anyone. The ten or so Koi selected for the article are probably those he has in stock at the present time and these Koi are all he has available for discussion. All he can do is list the available ones before him in order and give his genuine reasons for stating this. More often than not, the ten Koi are sold to enthusiasts before the magazine is even published and the article only relates to those ten particular Koi. The readers have no chance of finding others the same as these particular Koi elsewhere! C. There are many other attempts by many other proponents on Koi dealer’s websites and Koi forums with opinions given as how to select future ‘Jumbo’ Koi with detailed texts on bone structure etc. Some mention various Koi produced by various breeders and then use the Japanese word ‘keito’ when discussing ‘traits’ and this further confuses many readers. The texts on ‘traits’ are usually accompanied by showing pictures of famous champion Koi produced by said breeder as some form of ‘proof’. As to the dealer’s websites promoting these ‘traits’, I have yet to see an instance where Koi with the very same ‘traits’ are NOT for sale at his premises. Firstly, IF there are ‘traits’ on certain Koi produced by certain breeders from certain parents then they most certainly do not apply to ALL the offspring produced by those same parents. Also IF there are any ‘traits’ at all in Koi produced by any breeder, it relates to the minority produced by that breeder. These are often the most expensive Koi he has for sale and the chances of these Koi being offered for sale in the UK are total zero. In earlier times I have mentioned the development of ‘frame’ in some of Toshio Sakai’s female ‘Magoi Sanke’ whereby several examples have resembled skinny males until they reach some 8 years old and then begin to fill out to produce the wonderful female shape that is desired. However, I have seen many others from the same parents that do not grow to produce the same results despite the fact they are female. The huge problem that results from all of these texts, lectures, pictures and advertisements is that the man on the street is coerced into believing that ALL Koi from ALL these breeders will develop as per the information given when, of course, this is pure nonsense. Once again, the Koi under discussion are almost always very rare and very expensive specimens produced by these breeders and one can be assured there will not be a few dozen others of similar quality on sale at your local Koi outlet. Over many years and at Koi shows all around Japan I have tried to study the high end Go-Sanke entries in the larger sizes and estimate the breeder who actually produced these specimens. It is not exactly easy to do this, as I mentioned many years ago – there is a world of difference between a Dainichi Kohaku and a Kohaku purchased from Dainichi. As an example here, I have only visited Maruyama once simply because schedules would not allow me sufficient time but I have bought Maruyama-bred Kohaku several times – the last one I purchased was at Dainichi when Futoshi pointed this out as I was inspecting it in a bowl. He had purchased the Koi from Maruyama two years earlier for his own tategoi. 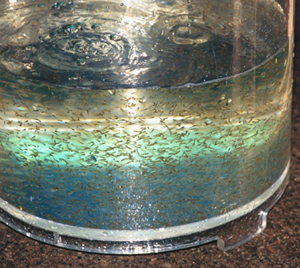 Whereas it is relatively easy to spot a Sanke that has been influenced with Matsunosuke blood – it is not so simple to hazard a guess as to which breeder actually produced it. In view of this, if there are ‘traits’ present then this would be the only real example I can come up with. As to high end Kohaku, there are real similarities produced by several high-end breeders today and it would be foolish to hazard a guess as to where they came from unless, of course, one already knew the answer. 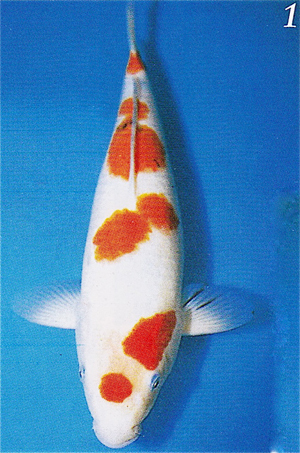 To put a few names into the pot here, the similarities of body, frame, pigmentation, skin and presence of special Kohaku from SFF; Dainichi; Momotaro; Marudo; Nogami; Kazuto and several others are difficult to actually identify with any real certainty when seen at a high-end Koi show. As to Showa entries one may just as well toss a coin! Much of the credit for these rare specimens to achieve world recognition in later years is down to the selection/keeping abilities of the breeders/owners concerned. Doubtless the parents used and the pairings of the parents play a major part but, in view of the minute percentages of success rates, the wild card ‘luck’ also plays a major part in the equation. 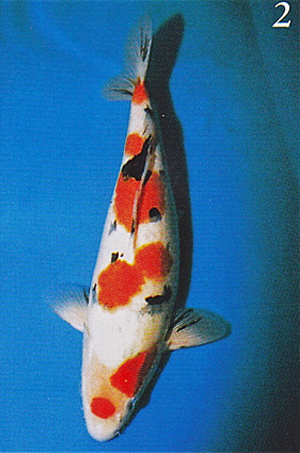 D. Around 1998, along came the ‘Master Classes’ – the original brainchild of a ‘UK Koi Dealer?’ who thought it would be a good idea to take enthusiasts to various breeders and allow the breeders to give three hour afternoon teaching sessions regarding selection; quality aspects; spotting deformities; feeding and other assorted advice and information. For several years I watched as overseas parties took part on these trips, I believe that some breeders also handed out certificates of achievement to the better students in the party. I believe it still goes on today with some agents and tour guides. I can picture the faces of the breeders when this proposal was first mentioned to them and I can give a darned good estimation as to how it was proposed to them. 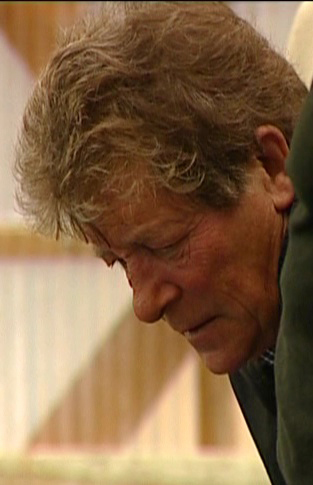 I can also visualise the face and the thoughts of the breeder observing some 20 or so Koi enthusiasts from thousands of miles away entering his Koi house to be ‘taught’ by him on the arranged day. Now, whether the breeder was genuine or not (and there was a mixture), then the breeder in question can only teach his class regarding his own Koi and specifically the ones he has for sale – full stop! It is extremely rare that any breeder will comment on Koi produced by others, simply because he has no experience of these other Koi. As to the breeder being able to ‘teach’ his students the best ways of developing his Koi after purchases had been made (and they were!) – does the breeder know the 20 different foods that may be fed, the 20 assorted temperature bands in which they will be kept, if they are to be kept in a bathtub, a state-of-the-art system or anything in-between? More to the point, does the breeder care? – the chances of seeing these eager students ever again are slim. As to the practicality of passing on any real and valid information via interpreters to some 20 foreigners gathered around assorted bowls of Koi for only three hours when each has his/her own questions to ask – I’ll leave that for you to decide. The visitor will get much more attention from most breeders if he goes along with a much smaller party. E. We must not forget the summing up of Champion Koi discussed at length by the Koi judges who gave these awards. The judges will generally attempt to give genuine reasons as to why this Koi was awarded the major prize whilst the owner of a Koi of an obviously much higher quality listens to the judge completely unimpressed and angry. The judge is fully aware of this situation but how delicate must he/she be in explaining to the disappointed owner that his Koi was ‘not in the best of condition’ on the day? I faced a similar situation a few months ago when asked to give some decisions on Koi entries at a show. Thankfully I only had to pass a piece of paper to the show chairman with the results and could then disappear for a coffee. There was one outstanding Koi on display, head and shoulders above the others and I felt I had to point this out when I handed in my results, as I hadn’t included this Koi in the awards. I had to do this mainly because I did not wish to give the impression it had ‘escaped my notice’ and secondly to give my reasons for not including the Koi in the awards. The condition of the skin and pigmentation had been ruined permanently by the conditions it had been kept in, such a pity for such a once-lovely Koi. Koi shows are purely beauty contests; they are also the future of Koi keeping – more than ever in recent times. As in any competition/contest, the entries require judging and the responsible judges should be available after the decisions have been made to give reasons as to why these decisions have been made should anyone request these reasons. 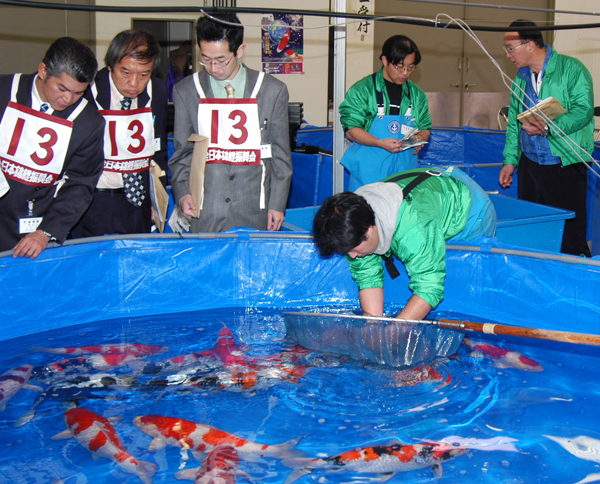 It is not exactly easy to be involved in judging Koi shows and, more often than not, these judges, like most Koi dealers, are self-confessed Nishikigoi fanatics themselves. 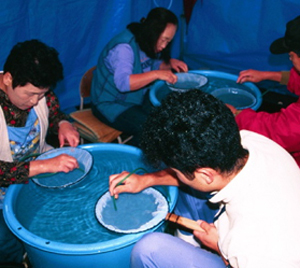 The judges must conform to certain ‘rules’ whilst doing their tasks and, like the dog judges who must decide the entries to award Supreme Champion to from the widest selection of breeds and sizes of breeds possible, so too must our Koi judges who must decide from Kohaku, Sanke and Showa entries to give a single result. I have the utmost sympathy here as the task becomes somewhat of an impossibility whereby the three most difficult varieties to produce, and are as far removed from each other as any Koi varieties could possibly be, are grouped in some kind of ‘Super Kawarimono Class’ for a single, common award. More often than not, and I fully understand the judges reasons, the Kohaku comes out trumps and takes the ultimate accolade. It may also be true that the very best three entries in the show may all be Kohaku but what of the top Sanke and Showa there? The Koi are judged as they are presented and displayed in the show ponds and the judges can only give their decisions as to the entries they see before them. Furthermore they can only give their opinions on the condition and quality of the Koi they see before them at that show. They should not be asked their opinions as to how a particular Koi will develop in the future because it is not their job and nor do they know for sure for reasons already explained above. They can also give their own reasons as to why one Koi took the award and why another entry up for the same award did not. In early times the judges had to explain on many occasions as to why a yondan pattern is of no more value than a nidan pattern when it is judged in a contest – although many enthusiasts thought otherwise. Today they have to do similar things when certain sumi ‘designs’ are mentioned and have been given non-official ‘names’ by the clever breeder in order to impress the reader/listener. Of the Koi judges I have spoken with after important shows over many years, usually at the bar later, many have confessed to having thrown the rule book out of the window after seeing an entry that has defied many standards but has staggered them with its overall presence! I really do hope that this ‘follow the heart’ approach continues! Whilst articles with texts and pictures about Koi are always welcome to many enthusiasts and whilst discussions on Koi forums cover a multitude of Koi related topics, the oft-discussed subjects mentioned above can never be covered truthfully in the depth required nor can I ever see when this will be possible. It must be remembered once again that every single Koi produced has some unique points and the impossible dream of ‘good, cheap Koi’ will always continue to be present in our minds. All the questions I am asked on these matters cannot possibly be explained properly, whereas it is simple to give specific dosage rates for this chemical or to give good advice on the various aspects of good pond/filter design. The reasons I am saying this is the FAQ’s above rely on one thing and that is ‘assumption’ by both the writer and the reader. Yes, the famous breeders do produce world class Koi – they also produce mountains of tateshita in order to get to the few world class ones. Simply quoting the name of a Koi breeder and publishing a series of shots of the Koi he’s produced that have gone on to become famous does not mean ALL his Koi are wonderful. 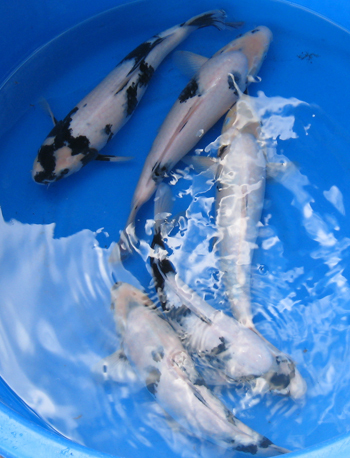 Alas, there are many Koi outlets who advertise their stocks for sale by breeder’s name and reputation, many enthusiasts often take this as an assurance that all Koi produced by this breeder are excellent. They keep them and grow them with their own individual keeping methods in their own available stocking rates, water volumes and temperature bands. How can the buyer who probably lives in a climate far removed possibly duplicate this? The name Omosako has been heavily covered recently and he is doubtless top of the tree in world class Shiro Utsuri production for some years. His very best stocks are truly superb but, to get to these few specimens, many others have to be produced along the way. His Koi can be bought in all price ranges from low (depending on quantity purchased) right through to truly superb individual examples and many prices in-between. It is foolish to think that his Shiro Utsuri have ‘traits’ that other Shiro Utsuri do not have. Equally good examples of this variety – tategoi or tateshita – in just about all price ranges apart from the very top 5% can be found at many other breeders at comparable or even lower prices. As mentioned on other pages of this site, the word ‘tategoi’ has also been abused and continues to be today. Once again this word simply describes a Koi that, in the breeder’s opinion, will become better in the future and thus more desirable and thus more valuable. 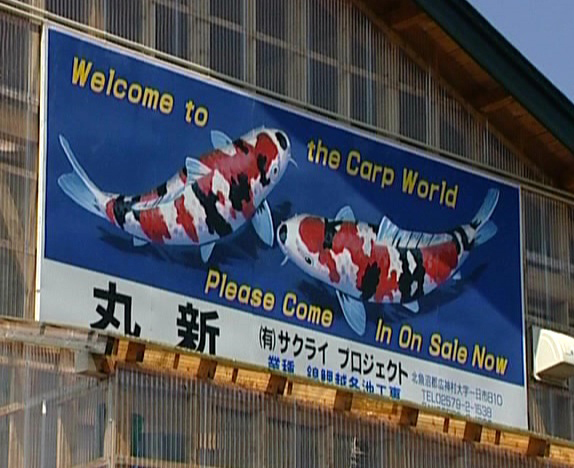 In 1995 I tried to give an example of this word with the two pictures below of the same Koi (please excuse the quality). These same pictures are the ones included in my first book ‘Koi Kichi’. The pictures were taken only six months apart and were simply to show changes that had taken place in that short period of time. I cannot recall since then how many enthusiasts have commented that they have since searched to find a Sanke with very little black pigment (as in picture 1) in order to transform it to the Sanke seen in picture 2! This obviously may have been a mistake on my part to publish these shots back then in order to save some real confusion and disappointments that followed. The truth of it all is that these pictures related to one specific Koi kept in my own pond and my own temperature bands and feeding regimes. Furthermore, that particular Koi was of exceptional quality and was not exactly easy to find nor was it cheap to purchase. On the other hand, there are many very inexpensive Sankes for sale that also show very little sumi, they will probably remain this way no matter how large they grow, hence reasons why they are cheap to purchase and easy to find! I have observed numerous culls of 12-month-old tosai at various farms all over Japan for many years; on some occasions I have taken part in these selections. Assuming there have been at least six earlier culls, all the remaining Koi are reasonably presentable at this stage and only some 5% are discarded completely during this cull. When these culls are completed it is usually around 5% to 10% that are classed as tategoi and the remainder are offered for immediate sale in quantity to anyone wishing to buy. If I had to select one aspect only of the tategoi selected – above all other aspects – it would most certainly be ‘pattern’ or ‘pattern potential’ without any question! Whilst there may be some with better skin shine than others, some with thinner bodies/frames than others and some with lesser pigmentation quality than others it is rare to find ANY without an attractive pattern or a potentially attractive pattern. This Koi below won world class shows in Japan, superb frame and superb skin quality combines with a very attractive pattern. 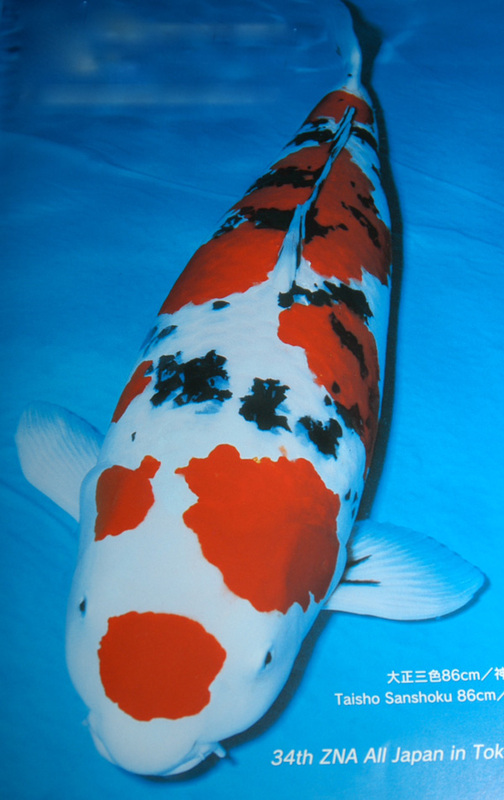 In Koi below rokusai, from my experiences, it is the pattern that really commands the high price quoted by the breeder. Only after this age does volume and length also accompany the desirability of the pattern but that takes a further few years of careful keeping in order to produce the desired result. Good ponds and good keeping techniques – pond design, feeding regimes, water temperatures, stocking rate, maintenance and several other factors of which luck plays a great part make it possible to develop any Koi to its best possible potential. If we do not have all these factors to hand then we must accept the reasons why the best potential is not achieved.